Lori from Bowmanville wrote to tell us about her wildlife sighting, she says ...... We saw our first Possum last night, sitting out on our back fence (we back onto a ravine) in Bowmanville. Our neighbour's small dog was barking at it and jumping up trying to get at it, but it just sat there and looked down at her. I took a couple of pictures of it, it is very cute. My husband and I thought it was pretty cool having one hanging around. Had a Possum around for the last two weeks, it comes in the evenings and it has a big long tail We are in Rice Lake, Gores Landing, Ontario. Turned on the back light last night and to my surprise there was a possum sitting by my apple tree. I wondered why my cats were acting funny at night by the patio doors. Possums in Hamilton? Shouldn't be surprised as I live near red hill valley. Took a few pictures in the dark as proof. I'm still surprised. He walked away with a tomato in his mouth that we had placed out as a target earlier in the day. Hope you find a warm enough place for the winter! I was a friends house in the Downtown core of Oshawa, Ontario. We went outside to the backyard and a Possum walked along a tree limb about 10 feet from us and just made itself comfortable, laid down and watched us for a about a half an hour. We weren't sure what it was and Googled an image of a possum and lo'n'behold, that was what it was. We saw our first Possum also. My daughter saw him/her first and I didn't believe her at first. 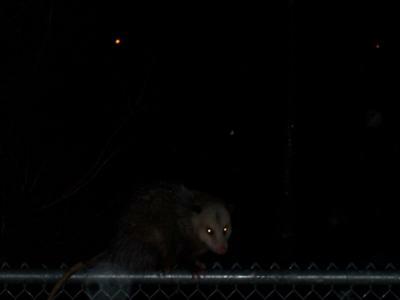 It's so awesome.... We have Raccoons and Rabbits and now a possum right here in town. I grew up in the country in Myrtle and it's nice that my kids can see some of these now too outside of a zoo. Yes, Possums are in Georgetown, Ontario. After trapping many Raccoons in my backyard it was quite the surprise to find a Possum in the live trap. They are smelly and UGLY! We had our first Possum sighting last night. I noticed something on the deck around 9.30pm and I flicked on the light and was surprised to see a Possum looking in the patio door! We live just east of Newcastle, backing and siding onto a forest ... when I got up to let my dog out this morning around 5:30 a.m. I was very surprised to see an Opossum under the bird feeder in our backyard having a good feed on the fallen seed. After reading these posts, I'm not so surprised anymore! It really was a beautiful creature! White face, grey body, long tail like a rat's tail. So wonderful to see different wildlife other than racoons and squirrels! We live just east of Bowmanville, Ontario, and have seen a Possum several times in the past two weeks. His back leg seems to be injured. The first time I seen him, my dog ran over to it and sure enough he played dead! Went to let the dog out last night around 1 a.m. Turned the light on and there was a Possum under the bird feeders by our deck, close to our door. Didn't let the dog out back. From Port Hope, Ontario. Went to let the dog in and noticed this creature climbing the tree. My daughter took a picture of it - turns out it was a Possum. The Possum has come to our patio door 3 nights in a row to look for food. We also have 6 Skunks and 2 Raccoons. Early this morning I put back light on to see temp. beside squirrel trap on rear deck, couldn't imagine, a 'Possum' in trap beside our grape-vine. Kept it there 'till day-light, got 3 good pictures, then released it locally. Now, I wonder if it was same possum Lori from Bowmanville saw? Last night about midnight, the dogs were barking as if they had seen a squirrel. Fearing it was a Raccoon and they were antagonizing it, we went to investigate and found a Possum calmly watching us and not moving away. When prodded by a twig, it moved slowly along the fence and then back-tracked and just stared at us.